The Green Badge on the left means your Instructor is fully qualified and known as an ADI or (Government) Approved Driving Instructor. They have passed a theory test and hazard perception test, a driving test, (both of which are marked to a much higher standard than the learner tests) and then finally a test of instructional ability. 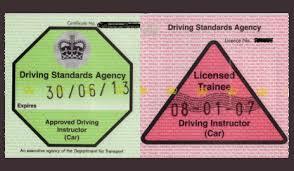 The Pink Badge on the right means your instructor has passed the theory test and the driving test but has not yet passed the instructional ability test, so is not a fully qualified instructor and is only allowed to work for (usually) a maximum of 6 months. It is issued to give someone experience with actual learners while still allowing them to pay for the costs of their training. The pass rate for the instructional exam is around 35% and there are only three attempts allowed at the test. If your Instructor is charging you for lessons and is not displaying either of those two badges in the windscreen, they are acting illegally and may not be qualified at all. Additionally, this means that any insurance on the vehicle is also likely to be invalid. You should contact the DVSA for further advice in those circumstances. A press release from the AA Driving school from a few years ago.